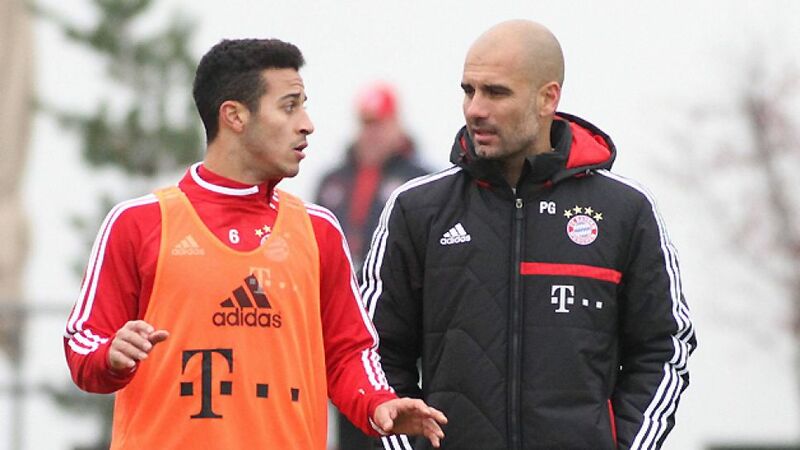 Munich - Back in July, when Pep Guardiola was just a few days into his new job as FC Bayern München coach, he made the shock announcement that he “needed Thiago’s qualities in midfield”. It was a startling statement, especially as Bayern had just swept aside all-comers both domestically and internationally, with the Bavarians’ midfield considered their strongest area. So with the 2013/14 season at its halfway stage, bundesliga.com takes a look at what has brought to the side. The Spaniard has featured in just six Bundesliga matches as a result of an ankle injury sustained early on in the campaign, making just four starts. However, while definitive judgement of Thiago’s impact on Bayern’s imperious season thus far should be reserved until further down the line, his displays since returning from the treatment room have shown just why Guardiola was so keen to land his compatriot. The 22-year-old made his comeback on Matchday 13, away to none other than Borussia Dortmund. It is no coincidence that the complexion of the game, finely balanced at 0-0, swiftly changed after Thiago’s introduction in the 64th minute. Bayern were fortunate to survive the first half unscathed and were laboring to establish their authority over their rivals in the second period when Guardiola called upon his services. An impeccable first touch, swift drops of the shoulder and the ability to produce the final ball gave the Bavarians an alternative they had been lacking until that point. Thiago’s unfazed demeanour and ball control gave the impression he could calmly play his way out of a tight spot even when outnumbered by opponents. After Mario Götze broke the deadlock against BVB, Thiago set up Arjen Robben for the decisive second goal of the evening with a sublime 30-yard pass. More recently he further underlined his big-game credentials by netting a crucial second in the against Raja Casablanca. His clever pass to set up Götze against Hamburg on Matchday 16 was just another fine example of his subtlety that compliments Bayern’s traditional power play. Thiago’s statistics for the season are equally impressive. He has completed almost 88 per cent of all his passes in the Bundesliga thus far and having played a total of 369 minutes, Bayern’s No6 has created 17 goalscoring opportunities for his team-mates, equating to one chance every 22 minutes. Since returning from injury, Thiago had more touches of the ball than any of his colleagues in two of the three Bundesliga games he started (on Matchday 14 against Eintracht Braunschweig and on Matchday 16 against Hamburg) - a clear indication of how the four-time Spain international is beginning to orchestrate Bayern’s play. In addition to Thiago’s creativity and technical skills, he is also unafraid to do the dirty work in midfield. Despite standing at just 172cm tall, he was won over 63 per cent of all tackles made, and has come out on top in almost 86 per cent of his aerial duels. This combination, then, of a sharp attacking mind, vision, quick feet and willingness to shoulder defensive duties have undoubtedly bolstered an already formidable midfield.